In January 2005, I was a second semester freshman just getting my feet wet at Concordia University, St. Paul as a transfer student. I didn't know a soul there but through miracles and some old-fashioned Minnesota nice, I met loads of people. One of those people was the sweetest girl you'd ever meet: Anna. We had an instant connection and quickly decided to become roommates our sophomore year. This time machine trip wouldn't be complete without a little love! Adam + Anna's story goes a little like this: girl and boy meet the first day of Welcome Week in 2004, start dating and marry after graduation. 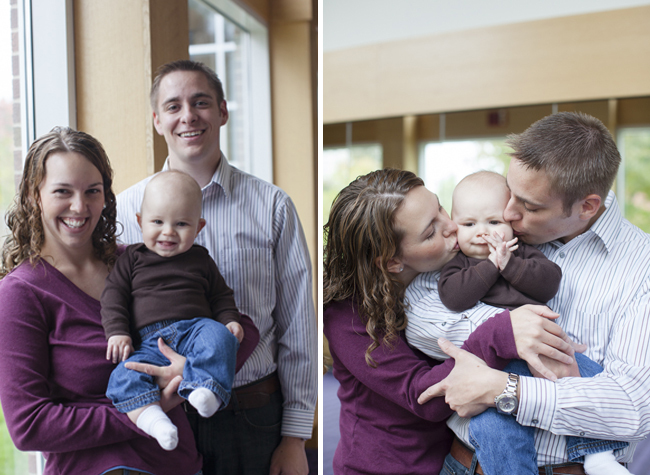 Add a move to St. Louis for seminary and just a few short days before Call Day in 2012, they welcome their first son, Aaron. This sweet love story is one I've had the privilege to witness both close and from a distance and I can tell you, these two are the real deal. Sweet as candy and pure as gold. They were that way when I met them in 2005 and they are this way when we reconnected during Homecoming last fall. As life goes on, we tend to lose touch with people who left an impact. Life happens. But thank Jesus for Facebook and a bond that was made over horrible Student Union food and challenging exams for Church Ministry & Practice! Anna was there, holding my hand during my first tattoo and we were each other's Mom Away from Home when we got sick in the dorms during that long Minnesota winter. We swapped shifts at the on-campus day care center and shared our biggest dreams over early morning coffee/study sessions. Meeting Aaron on a blustery October day last fall, I witnessed first hand my best college friend taking on her motherly role and I couldn't help but get a little verklempt. She has always been a maternal soul - with me, with our friends, with the kids we interacted with at work. Aaron is one blessed kid to have Anna as his Mama - and a strong godly man like Adam as his Papa. It's evident in their smiles and love for each other that these three are a dream team. I can't wait to see what else God has in store for them as they put down roots in Rochester! Minnesota is happy to have you back, Koglin family!